It is a false sense of motion, spinning or feeling of imbalance. Learn more about its symptoms, causes & treatment. Get the accurate diagnosis with India’s most advanced equipment & best doctors. Cure Vertigo Permanently. Many children attempt to create a sense of vertigo by spinning around for a time; this type of induced vertigo lasts for a few moments and then disappears. In comparison, when vertigo occurs spontaneously or as a result of an injury it tends to last for many hours or even days before resolving. Sound waves travel through the outer ear canal until they reach the ear drum. From there, sound is turned into vibrations, which are transmitted through the inner ear via three small bones -- the incus, the malleus, and the stapes -- to the cochlea and finally to the vestibular nerve, which carries the signal to our brain. Another important part of the inner ear is the collection of semicircular canals. These are positioned at right angles to each other, and are lined with sensitive cells to act like a gyroscope for the body. This distinctive arrangement, in combination with the sensitivity of the hair cells within the canals, provides instantaneous feedback regarding our position in space. 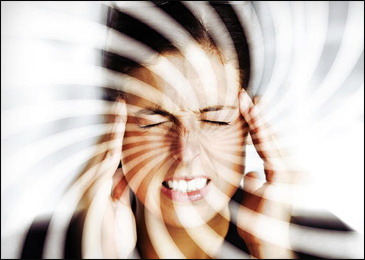 The symptoms of vertigo include a sense of spinning or moving. These symptoms can be present even when someone is perfectly still. Movement of the head or body, like rolling over in bed, can escalate or worsen the symptoms. The symptoms are different from lightheadedness or a sense of fainting. Many people experience associated nausea or vomiting. Physical examination often shows signs of abnormal eye movements, called nystagmus. 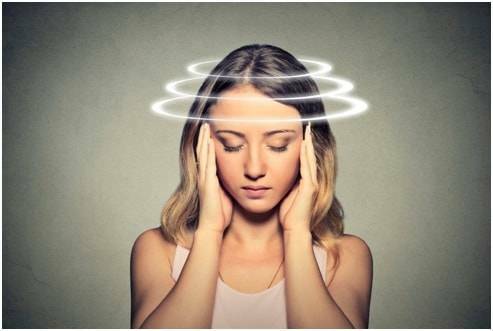 Some patients experience imbalance in association with the vertigo. If imbalance lasts for more than a few days, or if the vertigo is accompanied by weakness or incoordination of one side of the body, the suspicion of stroke or other problem of the brain is much higher. In those cases, prompt evaluation is recommended.